My mother assumed that I would leave home and suddenly be neat. This did not happen. I left home and continued to be a slob. I married someone similarly messy. We both hated cleaning. We both hated throwing out stuff (just the act. Both of us wanted less stuff, but hated hauling it out). It hit critical mass a few times and I had to run around and try to make everything 'presentable,' but it didn't fix the fact that I was still a slob. It's been bugging me more, lately. I have a cleaning service that keeps our home from being condemned, but there's still clutter everywhere. My home looks neat, but really, there are rooms with boxes piled up and closets that are nigh on unusable. When I heard about Apartment Thereapy's Cure challenge, I signed up. Uncluttering all the things at once is too much, but spreading it out over a year? Yeah, I can do that. 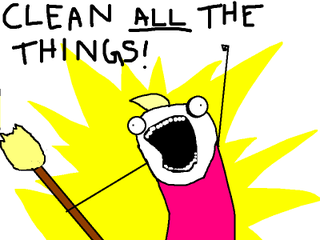 The challenge today is to make a list of everything that needs to be cleaned up. You take a tour of your house and note all the things you'd like to fix / clean / remove. Then, once you're done, you pick the thing from each room that would bring the most impact. True to form, almost all of mine had to do with getting rid of crap. There were some quality of life things, though, like getting a proper bar or hanging up some stuff on the walls. Looking at the list now, I realize that this is a doable thing. I can do this over the next year. I can make this place we have more livable. Anyone else doing this?